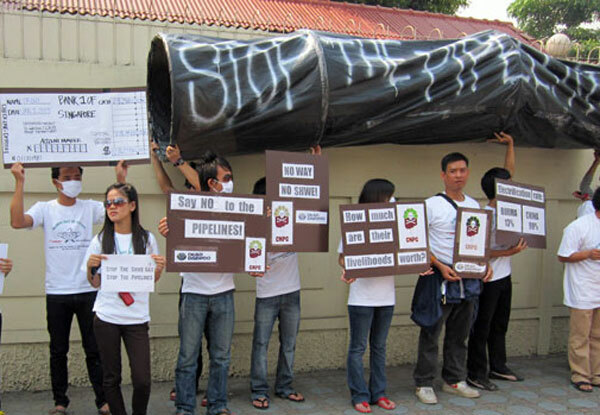 Ten residents of Kyaukpyu, located in the Arakan state, were sentenced to three-month jail terms September 26 for their unauthorised protests against the Shwe pipeline, a controversial Chinese-backed project. The demonstration attracted the support of more than 500 locals and was held in mid-April on Maday Island. The controversy that caused the protest stems from charges that the 800 kilometre pipeline project linking China’s Yunnan province with the Arakan state has resulted in both human rights abuses and environmental destruction while bringing relatively few benefits to the region. Htun Kyi, the lead protester, and nine others were arrested days after the event and charged under Article 18 of the Peaceful Assembly and Peaceful Procession Law with protesting without permission. The verdict for each defendant is three months in prison with labor. Lawyer Htein Linn, who defended the clients and announced the verdict, said that his clients had applied for protest permission four times and were declined each time. The group went ahead with the protest, marching to the offices of China National Petroleum Corp., the operator of the pipeline. The protesters issued a list of demands to the company. The government is reported to have denied the protest application under Section 144 of the criminal code, an emergency degree enacted last year to help curb ethno-religious clashes between Muslims and Buddhists. The protesters claim the law was selectively enforced. More than 600 locals from at least 17 villages in Kyaukpyu were present at the court for the verdict. They chanted for the release of the defendants after the verdict was announced. One woman at the courthouse noted that more than 500 people participated the protest but only 10 were sentenced. She added that most of the island’s residents were at the protest and most turned up again at the courthouse. We hope Arakan will rise up with Shwe Gas Project in Kyauk Phru.